A few minutes into the interview for this story, Christopher Kahunahana says he feels like sh*#. But, he’s quick to clarify, it’s OK. Actually, to Kahunahana, feeling like sh*# is kind of a good thing. It’s an integral part of his creative process as a filmmaker. Feeling bad will actually help him make his latest screenplay, WAIKIKI — which he currently is in the process of revising — even better. “I thought I was in this really great position,” he explains. “Now I am like, what the hell? Now I am in this position where I have no idea what is going on. “But,” he adds, “as I am going back through (the screenplay), I am starting to figure it out. WAIKIKI the movie centers on a woman living in her van and working at a hostess bar after fleeing an abusive relationship. Along the way, she forms an unexpected bond with a homeless man who is wrestling with his own demons. The film is slated to start shooting within a few weeks. While he might be most widely recognized from his years running Nextdoor, Kahunahana has been making movies since he was in college. After putting those aspirations on the back burner for a number of years, he sold the club in 2013 to focus on film. Now, with a couple of prestigious film fellowships under his belt, an internationally screened short, his own company 4th World Film, and WAIKIKI in the works, Kahunahana, it seems, has arrived at the destination of this 20-year journey. Kahunahana traces his interest in film back to his childhood living room in Waimanalo. His mother used to watch TV late at night, so in elementary school, when the rest of the house was sleeping, Kahunahana would sneak out of his room to join her for episodes of Mork & Mindy and The Twilight Zone. He had always excelled in art classes, and when he got to Kailua High School, he started taking photos for the year-book. After discovering video production while at University of Hawaii, he went on to work at a photo lab and spent his free time making his own movies. When the movies he and his friends made didn’t quite fit the bill for mainstream local avenues (his work back then tended to be extremely violent, he explains), Kahunahana opted to create his own outlet: the Honolulu Underground Film Festival. Taking place at bars, coffee shops, nightclubs — “wherever they would let us show that sh&#” — the festival welcomed material that was often deemed too dark, or too political, or too something for the mainstream. “We showed all these things that were not getting programed anywhere, so we quickly built a name and a niche,” he recalls. Kahunahana began traveling the country to tour various film festivals, and on one trip to San Francisco, he decided to stay. The move was intended for him to focus on filmmaking, but once there, he fell instead into coordinating promotion at a jazz club, later taking over as the owner. 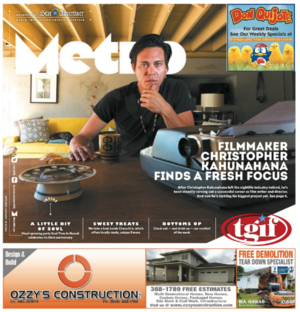 During the decade he spent living in San Francisco, he had other endeavors to satiate his creativity — he ran an art gallery focusing on little-known street artists and launched the Cinema Paradise Film Festival in Honolulu. He spent a series of years splitting his time among three cities — running the gallery in San Francisco, frequenting New York to curate art, and returning to Honolulu for Cinema Paradise. When a college friend wanted to open a nightclub in Hawaii and asked Kahunahana to join him, he was initially reluctant. “I was like absolutely not, I am not coming back to Hawaii to open a nightclub, I gotta make films,” he recalls. But, in the end, there were aspects of it that were enticing enough — he had the experience and the connections, and, after all, it was a way to make money — and he returned home to open Nextdoor in 2004. Kahunahana initially had planned to get the club on its feet and then turn his attention back to filmmaking, but it didn’t quite pan out like that. While he was still making films — for one, he’d participate in 24-hour film competition Showdown in Chinatown, which Nextdoor hosted — he largely put those ambitions on hold. As soon as he sold Nextdoor to the late Daniel Gray in 2013, he hit the ground running — winning a spot in the Sundance Institute’s Native Lab Fellowship, and writing and shooting short film Lahaina Noon. “It’s like a 20-year gap from the time that I wanted to (make movies) to the time that I am actually getting to do it,” he says. That might seem like some grand, sobering realization, but he says it plainly, matter-of-factly. In fact, he says this: “I am happy that it is happening now for me versus then. I learned a lot about the world in that time period. Kahunahana just returned from the Screenwriters Intensive, another Sundance fellowship, a couple days before this interview. (That was, he explains, the source of his creative low point of feeling like sh*#, after receiving notes upon notes about his work.) The process, as he explains it, seems like some kind of emotional gauntlet for writers. “They basically pull your skull back and dig around in there and then they throw you out on the street. So I have been trying to mend myself and put it back together. Over two days, the instructor guided a room full of filmmakers through a series of deeply probing questions — name a time when you’ve had to sacrifice your morality, name a time when you felt threatened — as a way to encourage them to mine their own lives for details to incorporate into their scripts. The process might have been difficult, but it’s a concept that Kahunahana already is well-versed in; his work already is largely personal. His years running Nextdoor functioned, in a sense, as a lengthy note-taking session. When he’d first moved into Chinatown, the area still had yet to go through its resurgence; dive bars populated the area in lieu of the upscale bars and restaurants there now. All of that plays into WAIKIKI. One of the characters is based on the owner of the now-closed Amy’s Place; the male lead is a composite of various homeless people Kahunahana knew. It’s elements like that, says filmmaker Ciara Lacy, that set WAIKIKI apart. “A lot of times, people will write about what they think something is,” says Lacy, who is one of the producers on WAIKIKI. “There is a difference between writing about something from the outside, versus writing from the inside out … In Chris’ work, you just know that there are pieces of him in the film. Creating stories that are honest and raw, after all, seems to be what has kept Kahunahana pursuing filmmaking all of these years. He aims to tell stories that are authentic, he explains, in their depiction of what it’s actually like to live in Hawaii — not the version of Hawaii that is marketed to tourists. WAIKIKI talks about issues that people face on a daily basis — the high cost of living, the high rate of homelessness, the need to work multiple jobs to just barely scrape by. It might not be the happiest version of Hawaii, he knows, but it’s one that deserves to be shared. “I think film has the ability to make people see the world in a way that they never saw it before,” he says. “It introduces people to culture in a way that they wouldn’t otherwise have access to — it gives them an inside view of what you find to be valuable. WAIKIKI currently is in the process of casting and will be filming this spring and summer. The next casting will take place at Box Jelly (307 Kamani St. in Kakaako) from noon to 5 p.m. April 2. For more information, visit waikikithemovie.com.